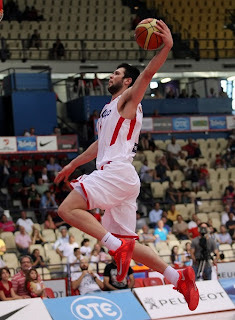 The Hoop: Papanikolaou heading to Barcelona? Back in 2009 Olympiakos bought Kostas Papanikolaou (2.03-F) from Aris for almost 1 million euros(950,000 euros). It seems that now they're selling him for 1.5 million euros to Barcelona according to redplanet.gr. By doing so they're even gonna make a profit of 550.000 euros on top of that. It seems that Olympiakos decided that they would try to renew the contract of Papanikolaou but his manager emailed them asking 6 million dollars for 3 seasons which amounts roughly to 1.6 million euros per season. That means that Papanikolaou would have a contract similar to that of Spanoulis. Obviously that ain't gonna happen. Papanikolaou also seems to have an offer from Atlanta Hawks but it seems that his likeliest destination is Barcelona that offered 1.5 million euros to buy the player and they could be offering him 1 million euros per season.